Hello I would like to show my image caption below my thumbnails in the excerpt. Is this possible? One more question how to I make the Show Post Author’s Info the name (author) it shows in that box clickable and it loads the authors page? Hi, just checking in on this. I have combed the support here and across the web and cannot find this answer. Is this possible? Probably with a child theme. Thanks guys for checking. So currently when you create a post using Graphene and you have a front page with posts from your blog it displays the front page posts in excerpt form with a thumbnail and no caption, and one can click on the post to go to the full posting/article and that is when the thumbnail shows with the full text from the article and a single post the one you just clicked on. What I would like is the thumbnail to show on the front page as well on the posts. 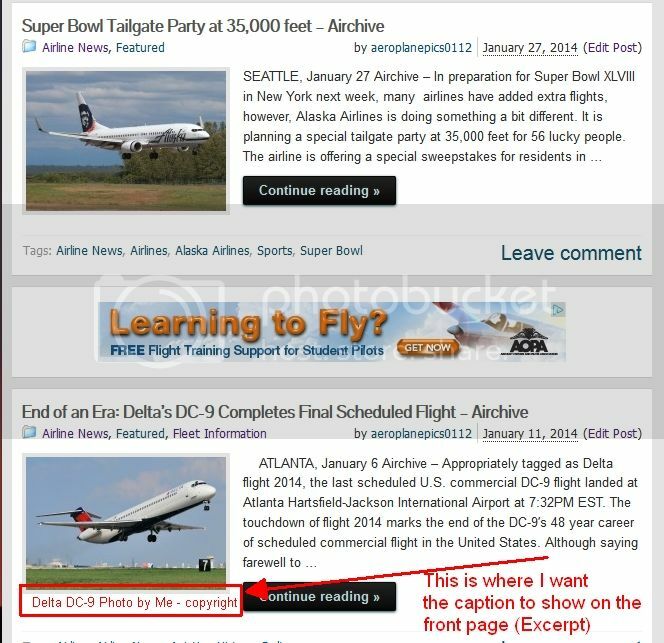 In regards to the author page if you click on the Aeroplanepics0112 under the author in the link Kenneth shared the author by the tile of the post where is says by aeroplanepics0112, however when one goes to the bottom of the full page posting where there is a little author bio that one is not clickable. I am using a child theme as well. “echo get_post(get_post_thumbnail_id())->post_excerpt;” is added code for image excerpt. Thank you Luko but that does not appear to be showing the image caption. You can use different action hook and you can give the span a class for styling with css later. Sorry it took me a while to get back to you. This did not work for me either. Does that code returns any error or it’s just simply doesn’t return thumbnail excerpt? Test it on my testsite and it works OK. Basic question, where did you entering your image excerpts? Under Edit Media/Caption?